Makes a nice little snack. . . . This sounds weird to some people but I love it. 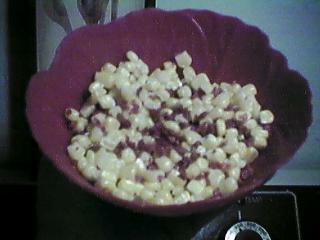 Just warm up some corn in the microwave, stir some margarine into it, and add Bac-Os. You may be surprised at how yummy it is. If you're not into Bac-Os, you can always try real Bacon Bits or even Morningstar Farms™ Breakfast Strips broken up into bits. Another thing that tastes great is Boca crumbles--fake ground beef--mixed in. Yum!